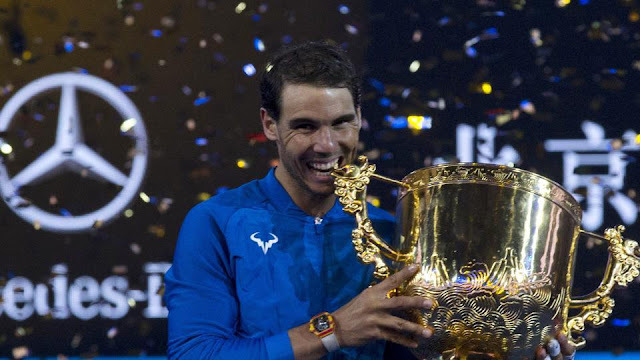 Rafael Nadal clinched the China Open in grand style as he defeated Nick Kyrgios in straight sets in the final to win the title for the first time since 2005. World number one Rafael Nadal won his sixth title of another remarkable year as he punished a disgruntled Nick Kyrgios at the China Open on Sunday. The 31-year-old Spaniard was never really in trouble against the temperamental Australian in a 6-2, 6-1 rout in 92 minutes on Beijing’s outside hard courts. Nadal, a 16-time Grand Slam winner, came to the Chinese capital on the back of winning his third US Open. He saved two match points in his nervy opener against Frenchman Lucas Pouille. But after that Nadal sliced through the opposition to win the China Open for the first time since making his debut in Beijing in 2005. Since then Nadal has gone on to become one of the greatest players of all time and he underlined his brilliance in swatting aside the 22-year-old Kyrgios. The world-ranked 19 displayed his best side in forcing Nadal to 2-2 in the first set, but his other side emerged later. Kyrgios was already on a warning from the umpire from the first game of the match for something he said. And when he went down 30-0 on Nadal’s serve at 2-2, he began the first in a series of lengthy discussions with the umpire -- frequently spreading his arms in despair. The Australian, going for a fourth career title, shook his head and continued the discussion as he trudged back to his chair, initially to whistles from the crowd and then cheers to encourage him. Kyrgios, whose undoubted talent has often been overshadowed by his on-court conduct, collected a penalty point as his title hopes quickly evaporated.